I love having new Bible resources. Especially ones that grab the attention of my youngest kids, and still manage to help me feel like I'm learning something. 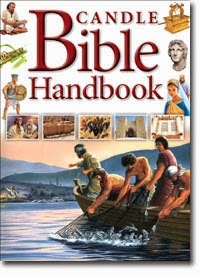 Candle Bible Handbook is a fantastic addition to my library. This reference is intended for ages 7 and up. I used it primarily with my 8- and 10-year-olds. We are working through the Old Testament this year, so I'm pulling this out to cover the various books of the Bible as we go. With Bibles, I usually end up reading through the book of Ruth, Esther, or Jonah, and checking out all of the features and notes. That way I've seen an entire book of the Bible, and it is something I'm already familiar with. The set-up of this reference though means that even the longer books of the Bible only have a few pages of notes. So I'm going to look at something a bit more unusual for purposes of this review. Let's try 2 Chronicles. Each book starts out with an outline, in a little yellow box, and these are simple and straightforward. Perfect for kids, without a lot of extraneous stuff. For 2 Chronicles, it breaks it down into Solomon's reign (chapters 1-9) and the Kings of Judah (chapters 10-36). There are a couple sentences describing both sections. Each book includes some text describing the book. Why it was written, who wrote it, who was intended to be reading it, or other such stuff. For 2 Chronicles, there are three paragraphs describing the intent (to show the importance of worship) and a basic overview. Each book includes illustrations. 2 Chronicles has quite a few of those. There is a drawing of Solomon, a two-page spread of Jerusalem in Solomon's time, and a two-page spread of Jerusalem in the time of Hezekiah's time. Often, there is a box of Key Events. For 2 Chronicles, that includes a map (most books have a map included somewhere) and talks about the exile. Many books include a box with explanation of something cultural or historical. 2 Chronicles has a box talking about Asherah (a goddess of the Phoenicians and Syrians), which helps to explain the discussion of Asherah poles. Each book has a section titled "Look out for..." that gives you ideas about things to watch for as you read the actual text in the Bible. This may be about my favorite section. We can read through the couple of pages in Candle Bible Handbook, and the kids are then actually listening for something specific when we read. Each book also has a FAQ section, in this case, with questions like "Just how rich was Solomon?" My kids like this section. Each book also has a Study Questions section, which I try to look over before we do the Bible reading. Then I can stop when we finish 2 Chron 6, and I can ask "How did God keep his promise to David?" I am totally loving this resource. Disclaimer: I received this book through Kregel Blog Tours. No other compensation was received. All opinions expressed in this review are my own.